The most often used tool in the kitchen, owners frequently purchase two or more. Small size and Best's own slender 8 wire design offer fingertip control into the tightest corners Stainless steel wires, 5/8" diameter handle and stainless handle. Dishwasher Safe. These stainless powder coated handles add the perfect touch of color to your kitchen. 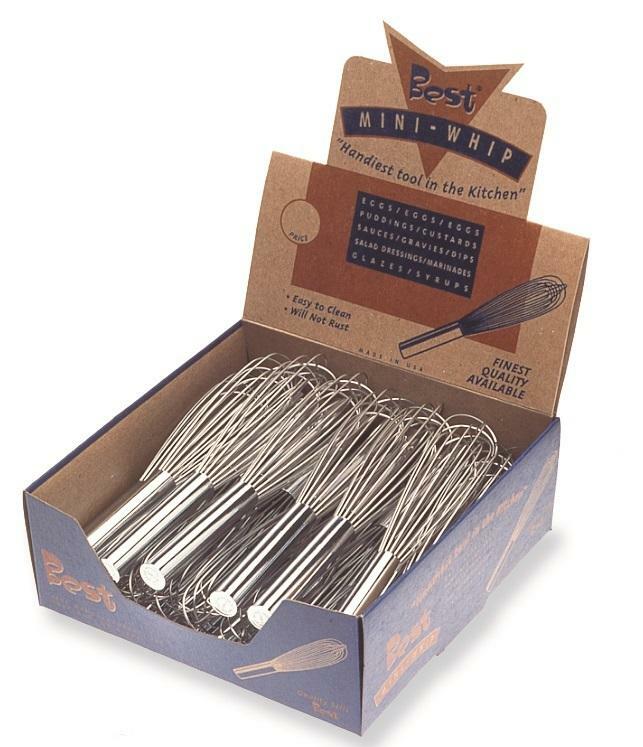 Five of our most popular whips and the waffle head masher are available in 6 flavors. Stainless steel wires; 7/8" stainless steel handle, dishwasher safe. Larger Standard French Whisks are available. Please see the Food-Service Tab for additional information. Thick sauces, stiff batters, mashing and blending coarse ingredients - where a job requires muscle the Heavy provides it. Eight 12 guage stainless steel wires and 1" diameter stainless handle are proportioned/weighted to perform well for the heaviest job. Not every cook responds to the look and feel of stainless; for these we offer warm wood - nature's ergonomic answer to a good grip in a standard-sized whip. Smooth, turned and lacquered birch hardwood is entirely dishwasher safe. Stainless steel wires. Our alternative to natural wood.